The President has assured the USA that the Prosecutor-General’s Office of Ukraine will fight against corruption. President Petro Poroshenko has stated that a new prosecutor-general of Ukraine will be highly professional, responsible, well-trusted. He said this speaking at the Forum "Ukraine’s Battle for Freedom" in Capitol (Washington). 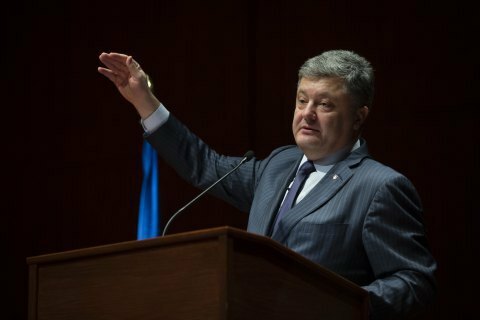 "The appointment of new highly professional, responsible, well-trusted prosecutor-general will trigger a new page in anticorruption policy of Ukraine," Poroshenko pointed out. He also stated that that political crisis will be settled this week. "I expect that in several hours, a new coalition in the Ukrainian Parliament will appear and propose a new candidate for Prime Minister. I am absolutely sure that the solution to the parliamentary crisis is already very close. Most probably, it will be achieved this week," Poroshenko said. The President stated that the program of a new government would be based on IMF commitments, Association Agreement with the EU, anti-corruption fight and the Minsk agreements implementation. As reported before, the Verkhovna Rada passed the resignation of Prosecutor-General Viktor Shokin on 29 March. Now the President is to dismiss him and appoint a new candidate for the parliament consideration.